The Traditional Crafts Blog: Sheffield council to audit metal trade skills. Sheffield is famous across the world for steel, cutlery and metal trades. Steel was first mass produced here using the crucible process and stainless steel first made into cutlery here in 1913. Times move on however, the majority of that kind of manufacturing moved out to China and Sheffield Council have successfully invested in rebranding the city "Creative Sheffield"
English Heritage have surveyed and assessed the cultural value of the buildings left over from the centuries of metalworking, many of these buildings have been renovated and found new uses, the best are highlighted in the book "One Great Workshop" The fate of one of the most important, Portland Works still hangs in the balance. The tools of the trades have been collected and aural histories recorded. The one thing that has been left out is the very thing that made Sheffield what it was, the skills and knowhow of the metal trade crafts. This is what UNESCO call intangible cultural heritage and around the rest of the world folk are working to preserve such knowledge as part of their cultural heritage. The UK is one of few western states that has not signed the 2003 UNESCO convention on ICH and this means our old craft traditions are not recognised and not supported. At a local level typically councils have a heritage department which is responsible for old buildings and museums, and a culture department which is responsible for arts, music, theatre etc. Traditional crafts fall between the two. Over the last 12 months I have had various meetings and correspondence with Sheffield City councilors highlighting these issues and this week learned that the council has allocated funds to conduct an audit of the surviving metal trade skills. 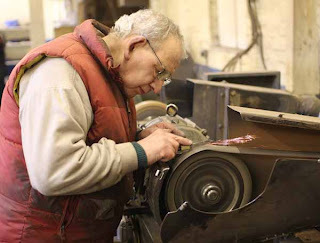 This is a great step forward, the Heritage Crafts Association have highlighted the work of many Sheffield crafts and trades but we have no idea how many survive and which ones are in danger of dying out. The next stage will be to asses which trades are endangered and take steps to promote and preserve them. This is not about propping up moribund industry, often these are viable businesses and potential fulfilling jobs. Trevor Ablett for instance makes simple folding pocket knives, he has an order book till Christmas and can make a good living from his knives but he is 67 and has no apprentice. Few visitors to Sheffield would know he existed and it would be very difficult for any visitor to find a working knifemaker or indeed any craftsman in the city. By contrast in Asturias northern Spain where they also have a knife making tradition (though far less famous) the knife workshops are very much promoted on the tourist trail. 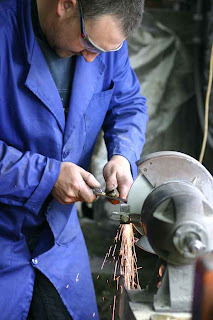 The workshop I visited received around 300 visitors a day in the summer, many of whom bought knives. The beauty of this is that not only is it providing good rewarding work (Antonio junior working alongside his father) but the heritage of the town is clearly alive, not presented as some dead way we used to make stuff in a museum. Better still because there is still a market for the product presenting heritage in this way costs a fraction of what it would cost to present a facsimile of a workshop in a museum. A fascinating article Robin, and you'll know it's one very close to my heart. This is a glimmer at least. I hope you get much further with Sheffield City Council, who for some considerable time did seem to forget where, to a large degree, the 'city' came from in the first place. The good news on our Sheffield scissor-making company is that we have finally managed to source and fund an apprentice at long last - Mark is 20, keen to learn the craft, seems willing to stay in the trade, and could provide our particular industry with a future. 'Scissors' are not defunct, nor a moribund industry; scissors are in fact ubiquitous, and a pretty large and global industry. However I find it heartbreaking that there are only two small companies left in the UK (there were 150+ scissor companies in Sheffield alone in the 1970's) - and both now with ageing workforces. And I find it deplorable that funding or aid for any training or apprenticeships in the 'art' of making scissors is completely non-existent. Sheffield Council have at least in the last few years begun the annual "Galvanize Sheffield" festival, based on metalworking in the city. Many of the city's metalworking companies and individuals, along with the small Galvanize team themselves, have put a huge amount of time and effort into the campaign. Yet funding, particularly regarding publicity, towards the event seems to have been severely limited, to the point where most Sheffield folk I speak to have still never heard of it after three years of regular running. But we, as an industry, cannot just rely on 'charity'. We can compete on price to a degree, and we can more than compete on quality. Yet we still struggle in the modern market place. Maybe we're doing something wrong! Or maybe we just have to look at the UK customer base, and wonder why they are not more loyal to home brands in the first place.